Many know that I am a Detroit baseball fanatic and was crushed at our loss this season to the Red Sox in the American League Championships. But all the mourning and soul-searching has come to an abrupt end on the news that former Detroit Tiger Brad Ausmus — and most importantly former coach of Team Israel — will be the new Tiger’s manager. Of course how Ausmus will work out with the most accomplished team in the MLB remains to be seen. The fact that he is Jewish doesn’t really impact that much on the team. We all hope that he has an ability to motivate a team that has had its spirits crushed by two post-season meltdowns. He will have to be part motivational speaker, part sports psychologist, part manager, and part Detroiter. Not an easy gig. His Jewishness may indeed play a factor on the season. Look to see matzah this Passover at Comerica Park. And what number has Ausmus chosen to wear? #7, in honor of Shabbos I am sure. What a great early Chanukah present! The power of teshuva can turn this hurtful incident into a one that teaches compassion and love. 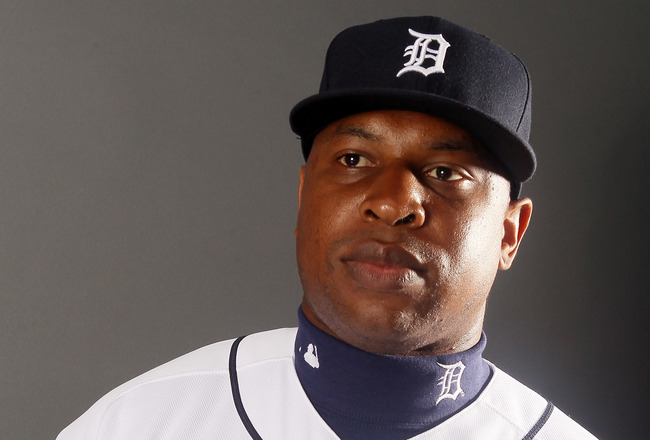 Delmon should keep swinging the bat in a Tigers uniform because Judaism believes in the God of second chances. Judaism instructs us that we must give everyone the opportunity to make amends. In fact, I have a few suggestions that can make Delmon one of the most popular players in the Jewish community today. When Young was arrested on April 27th, and charged with misdemeanor aggravated harassment and assault, Motown, the baseball world, and the Jewish community cringed in disbelief. Some called this the end of his short career. Baseball commissioner Bud Selig, who is happens to be Jewish, suspended Young for seven days without pay. With a $6.75 million dollar salary, that added up to $258,000 in lost wages. The Tigers were prohibited from further disciplinary action because of baseball and the players’ association labor agreement. Young issued an apology to his friends, family, team and the community, and confessed that the whole incident was related to an alcohol problem that he will now address. And while there is part of me and I am sure many other Jewish fans, who, every time that Delmon Young is going to approach the plate for the foreseeable future, will be reminded what happened, that doesn’t have to be the case. The entire essence of the Jewish High Holidays challenges us to seek out those that we have wronged and ask forgiveness. We ask God for forgiveness for what we did against God, and we ask friends and family to forgive us for how we let them down or hurt them in the previous year. The Days of Awe compel us to believe that everyone deserves a second chance. Does this forgiveness extend to Delmon Young? You bet. While the hurt in me thinks that Young and his number should be ejected from baseball, on further contemplation, that would be wrong. Rather, let’s give Young a chance to learn from his mistakes, become a spokesperson for tolerance and most importantly, let him become an ally of the Jewish community. Delmon, if you sincerely make amends now you will be forgiven in an instant. Delmon, I am sure that you can become not only a friend to the Jewish community, but that you can become a shining example of the power of teshuva, the power of the individual to transcend their shortcomings and become great. We as a Jewish community will forgive you, and make sure that you are remembered as a great friend of the Jewish people.